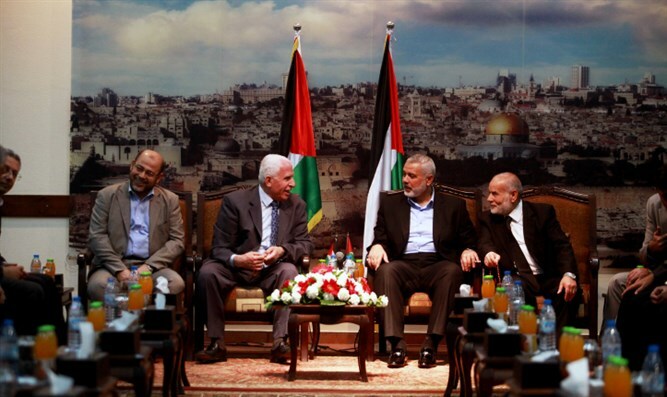 Reconciliation agreement between Hamas, Fatah will bring Hamas into Judea and Samaria, says Middle East expert. Last Thursday, the Hamas terror organization and Fatah faction of the Palestinian Authority signed an agreement on ending a decade-long split following talks mediated by Egypt in Cairo, with Palestinian Authority chairman Mahmoud Abbas calling it a "final" accord. Under the agreement, the Palestinian Authority is to resume full control of the Hamas-controlled Gaza Strip by December. According to Middle-Eastern Studies expert Professor Moshe Sharon, the agreement is a mortal danger to Israel, as it will result in Hamas wresting control of Judea and Samaria from the Palestinian Authority. "There is a reconciliation agreement between two terrorist organizations operating against Israel," Sharon told Arutz Sheva. "It's not like is the people of Ramallah are totally righteous and the people of Gaza are evil. Both factions are virulently anti-Israel." According to Sharon, the reconciliation agreement will lead to a flood of firearms and other weapons in Judea and Samaria. "According to the reconciliation agreement, the Gazans can keep their huge arsenal of weapons, thousands of missiles and tunnels. They can now enter the West Bank and establish more Hamas cells and the Palestinian Authority will allow them to operate freely." "If there are elections in Judea and Samaria, Hamas will win and they can put (Hamas head) Khaled Meshal at the head of the Palestinian Authority. This creates a very dangerous situation. On the other hand, it allows us to act against them as we would against an enemy - and Israel knows how to act against an enemy. " Professor Sharon called on Israel to deal harshly with the Palestinians. "It is impossible today to go back to what was before the Oslo Accords. These were agreements that were a disaster for the State of Israel. However, that does not mean that we have to keep every word that is written in the agreements," he contended. "If the Arabs violate the agreement then we can impose sanctions. They would stop the daily incitement in their schools if we shut off their electricity and refused to operate their sewage system" Sharon concluded.